Sjogin is a small traditional Scandinavian workboat (I assume that she’s a koster type) that we sail on the north end of Barnegat Bay in New Jersey. We keep her in an old fashioned boat yard, David Beaton and Sons in West Mantoloking, near our home. 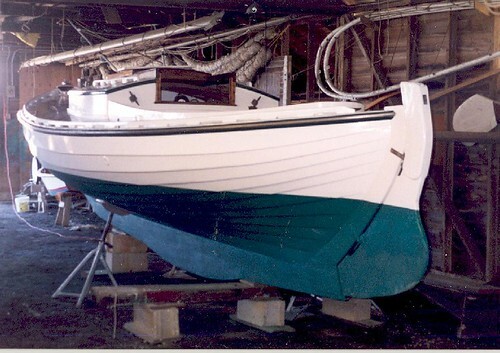 She seems to be modeled on a typical clinker (lapstrake) Swedish inshore fishing boat and not one of the more refined carvel types. Sjogin is 22’ LOA, 8’ 6″ Beam and draws about 2’9’’. She has a long shallow keel. Also she’s never had an engine. I carry a sweep to scull when needed but otherwise use whatever wind’s available to get in and out of her slip. You can see lots of photos at my Flickr page. 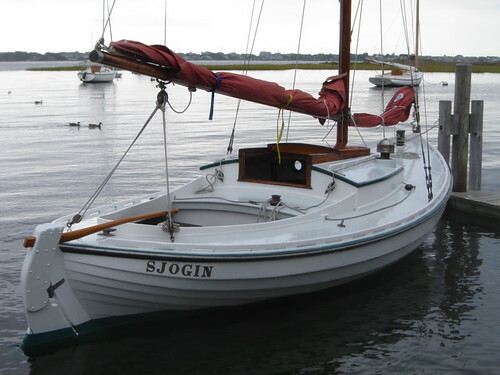 As far as we know, Sjogin was built in Southern NJ in 1961 by a gentlemen named Gullen. We have no further details of her builder or designer. While she has workboat roots, her proportions and details suggest she was drawn by a well practiced eye. If any of you can help identify the designer I’d be most grateful. I thought she might be designed by Murray Peterson but his son Bill thought not. I don’t sail very far from the boat yard, mostly content to sail near the local marshes and heave to and read. Sjogin has a great ability to heave to. 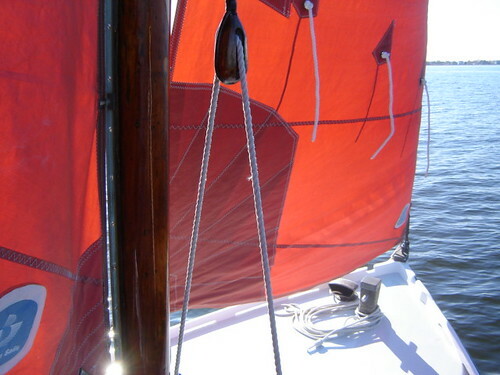 When on the wind you can remove the tiller, leaving the jib sheet set, and she will come about and settle on the opposite tack for as long as you wish. Or until you run out of Bay! 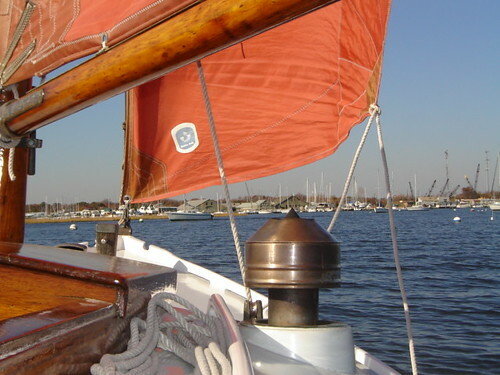 I keep her in commission all year long as the off season sailing is a lot better with the absence of Cigarette boats and jet skis which have ruined sailing on Summer weekends in these parts. Some of my favorite sailing is in the off-Season when the only company on the bay are Buffleheads and Mergansers. 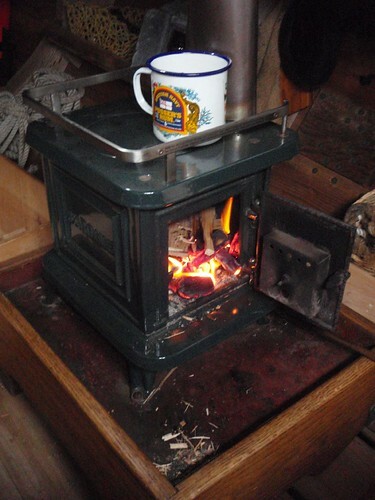 She has a small woodstove on board that came from Navigator Stove Works. There are some photos on their web site here: http://www.marinestove.com/installation_views.htm Scroll down to #10. 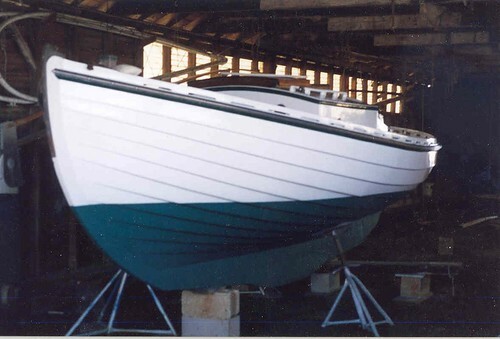 She was also featured in the November 2004 issue of Classic Boat on marine solid fuel stoves and the January 2008 issue of WoodenBoat. Here is the First Post I made on the WoodenBoat Forum, describing her vital numbers and seeking help in identifying her designer or type. Here’s a collection of Sjogin photos I’ve posted here or are found on my Flickr page. Topping lift set up which takes the drive out of the main. Sitting quietly, waiting for crew. The Sardine wood stove. Sjogin’s heart for these last six years. Winter position, bow to the northeast. With the chimney on the lee side for a westerly breeze the stove will draw better. Love the new Kirby paint. Low luster helps hide the scars. Fresh for her Summer makeover 2006. Reaching for Swan Point on Thanksgiving weekend 2006. Hove to. Note the simple tackle for the main halyard. Classic 15th century technology supplies a two to one advantage. The view forward. The sweep is used to scull when the wind doesn’t serve. Curtis Point to weather. Hankin’s Island visible through he shrouds. Friend Kent crossing my bow. 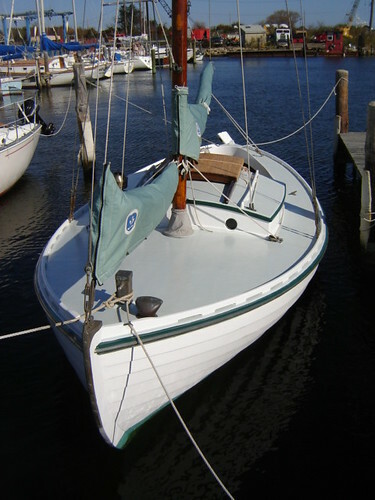 His boat is a Herreshoff (Halsey) Eagle. This past summer (2005) showing a just rigged Sjogin. Taken by my son Jeff around Christmas 2004. Taken several years ago during one of her Summer refits. She is beautiful. I have recently had the pleasure of visiting Finland and seeing the various lapstrake double ended boats there.. there are many versions, most are now motorboats. She is lucky to have found you.. well done. Thank you Kendall. Strange how some boats just grab you. She suits us just fine. It’s the kind of boat that inspires one to begin sailing in the first place. Thanks Gary. She’s out now for her annual refit. BTW! Proper pronunciation of Sjogin, please!! She’s pronounced so’ – gin. The J is silent like the P in swimming! That’s the first joke I learned from my Dad. Would I know your father? I’ve been at Beaton’s sins 1979. Hard to believe it’s 30 years. Sailing is great, followed by well earned naps. Russ: Jim Wagner was his name. He didn’t keep a boat there, but had a penguin built (#8839) by Beaton’s in the late 60’s. He and I both grew up on the Metedeconk and he would love to drive through the boatyard and look at all of the old relics, of which there are still some but not nearly as many as years ago. A truly beautiful boat …! 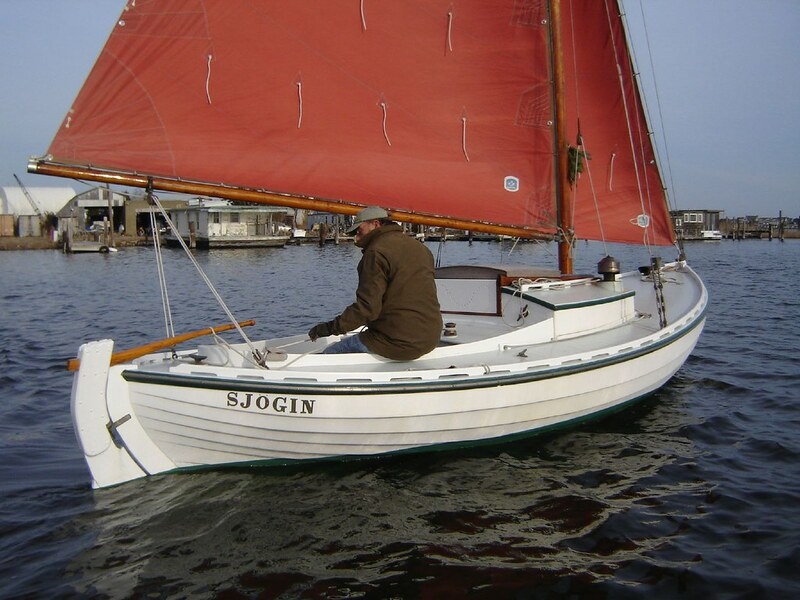 !… I love “Sjogin” … the boat is so much like my Tahiti Ketch “Maverick” we sailed for some years, and “Direction” a Colin Archer (type) designed cutter that I sailed on with my godparents as a small boy!! (Check out the book “NXE” by Rockwell Kent sometime … it is the beautifully written and illustrated story of the voyage on “Direction” to Greenland in the 1930s!!) …. Due to time constraints, ….. etc….I do now sail an ODay 23 “Sea Drifter II” in CT, but also like just “heaving to” and jogging along under reduced main …no need to race anywhere! Thanks for the comment. I have a well thumbed copy of N x E at home; neat connection. Do you have any pics of Maverick and Direction to add to my double ender collection? 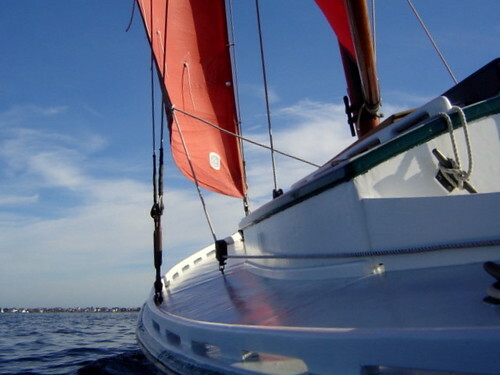 I have a nice picture of “Maverick” (Tahiti Ketch) which I will attach to an email to you. She was built in 1962 in MA, and several years thereafter, sailed by Warren Ford to England, Gibraltar, Panama Canal, Galapagos Islands, Vancouver,.., etc. He was rolled over in a Hurricane off Gibraltar and lost part of the mizzen mast … and the sails were shredded by machine gun fire off Cuba. We bought her in 1970 and sailed her for almost 10 years. I last heard from the subsequent owners who were on Cape Cod. “Direction” was bought by Carl and Margaret Vilas after the shipwreck in Greenland, as described in NXE. 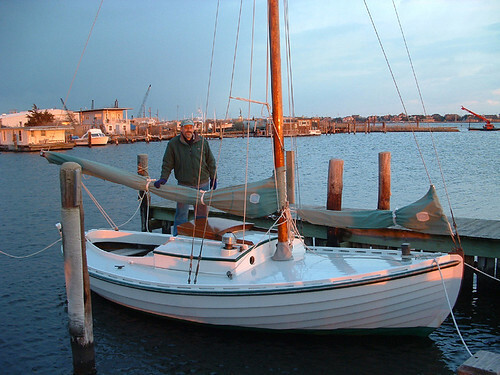 The boat was repaired and sailed to their home in Branford, CT. 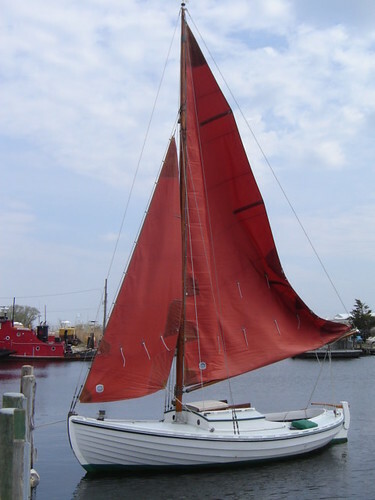 They were very active in the Cruising Club of America, and the Essex Yacht Club (CT)…and sailed extensively on the Eastern Coast and in Nova Scotia. He wrote a subsequent book “Saga of Direction” which contains many photos, history of the Colin Archer design, and “sagas” of their cruising and boat repair over many years. Carl Vilas is now deceased. I sailed with them (my Godparents) many times as a little boy from Hamburg Cove, CT to LI. I can scan the cover photo if you like, or, better yet, get a copy of the book .. you will be intrigued!! I have loved Colin Archer designs my whole life! Thanks for the link. I completely understand your obsession with this boat. If my Grey Seal looks half as beautiful as Sjogin when finished I will have succeeded. Take a look at the Seneca Fingers Lake Yacht Club web site. http://www.senecayc.org/. It has a few pictures of the wooden sail boats, canoes and rowboats used on the Finger lakes prior to power boats and jet skis. Comets & Star wooden sailboats is what I was trying to recall the other night. The Parkman Star in particuliar made by Eldelee Inc. now long defunct. There could be some proto types out there now. Take a look for giggles. Great boat! Great blog. I own a Rozinante–in fact, the Rozinante built for (but never sailed by) L. Francis himself–and I think Sjogin is every bit as nice. And, like you, I only keep one oar in the water. Thanks John. 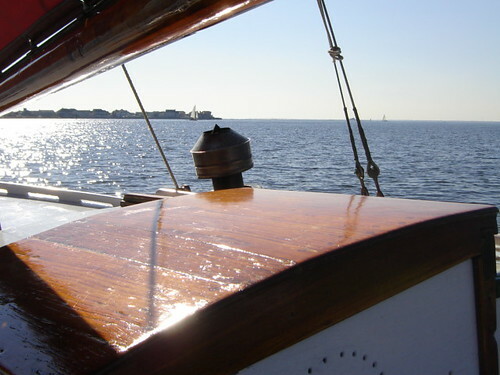 The Rozinante is one of my favorite boats and arguably one of L. Francis Herreshoff’s best designs. Where do you sail yours? russ – just found your blog after reading over at Baydog’s blog. nice work, and you have a beauty of a boat. Sjogin reminds me a lot to the boat used in the german TV film “Das Rätsel der Sandbank”/”The Riddle of the Sands, named Dulcibella. Most of the sailing scenes in this true thriller are filmed in a quite realistic way. Dulcibella was gaff-rigged but on http://www.FKY.org there is a member with a top rigged version named Margarita. It looks like a traditional fishing boat. Hello. 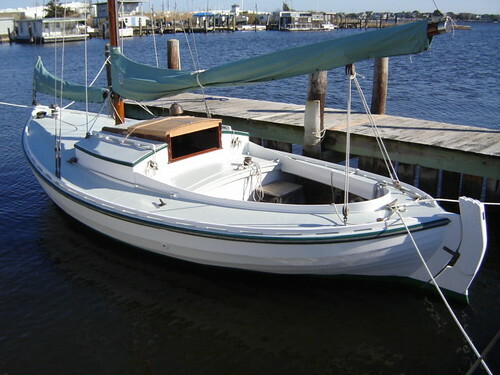 I have a 17-foot Seabright skiff built around 1980 by Firman Shaw in Egg Harbor Township. It took me years to rebuild the boat, but then I got sidetracked by other boats and I’ve never put it in the water. Now that I’ve seen yours, I want to sail mine next summer. It’s called a Shaw Craft. I think Shaw mostly built duck boats and skiffs, but he may have built yours. Mine has a raised deck and a small cabin. White cedar on mahogany braces. Oak ribs. Oak tabernacle. Centerboard. @anthony @russ In about 1968 (I was 12) I sailed with Warren Ford on the Tahiti Ketch Maverick from West Port, Washington thru the Strait of Juan de Fuca to Olympia, Washington. This was quite a memorable trip for a kid who grew up land-locked in Montana. My father then accompanied Mr. Ford on the return sail down the West Coast on what was supposed to be the beginning of a circumnavigation of the globe. They left in late Fall and immediately hit a severe Winter storm. 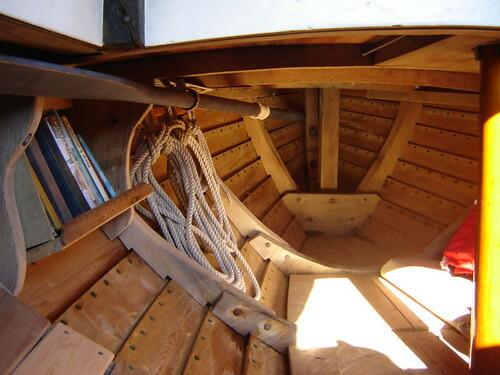 I remember that the compass was mounted on the Mizzen and was off a few degrees after that storm because the Mizzen was twisted in the storm. My father left the boat in California but never lost his love of sailboats after that harrowing experience. What a charming, shapely craft Sjogin is! I’ve been following the progress of her restoration for some time now and have thoroughly enjoyed the photos and descriptions. Thank you. 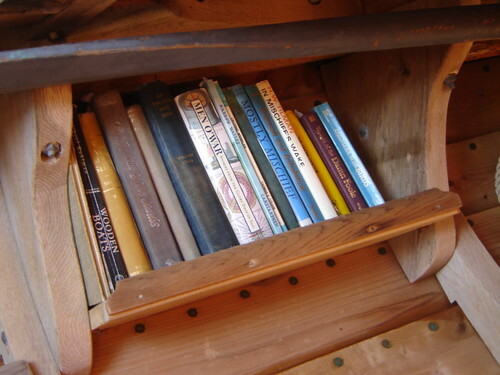 I couldn’t help but notice the Tilman books in your library photo- H W Tilman has long been a hero of mine for his mountain exploration with Eric Shipton, as well as the Mischief series of sailing books. I also see Riddle of the Sands…what a great book to have on a small ship like Sjogin- not so different from the canoe yawl of Childers novel. Good luck with your refreshed boat, and kudos to Beatons & yourself for such attention to detail. ..I just completed the backbone and starting to make the frames when I see one photo of yr Sjogin. Well I thing we can go do this nice design and made it also sailing not only motor. If need to rebuilt some part of my project ,..never-mind,.. I think Its worth to do it. I get my plans from Sweden where this boat is called Snipa,..traditional fishing boat. I will do my own modification on the original Snipa design. I will inform on the project progress . My compliment for yr Sjogin. If somebody would like to join my project,..just let me know,..we can make two or more in the same time in my Boatshop in Central Java, Indonesia. Please,..feel free to contact me in my Emai robertodajava@yahoo.com or my Facebook group “parliamodibarche” for additional information. Tks. I’d like to discuss your plans. Seems the Snipa design has fuller sections than Sjogin. I’ll send you an email soon. Curious to see what you come up with. Thanks for the nice comment. One of the items I’d like to do below is have a longer bookshelf. Perhaps under the side deck opposite the stove. If it was deep enough, it would serve as a backrest when sitting on the berth in front of the fire. RotS would get pride of place. Greeting on a super sailingboat! I came across Sjogin during a websearch for Sardine stoves, but hasn´t been able to stop returning to the pictures of Sjogin. 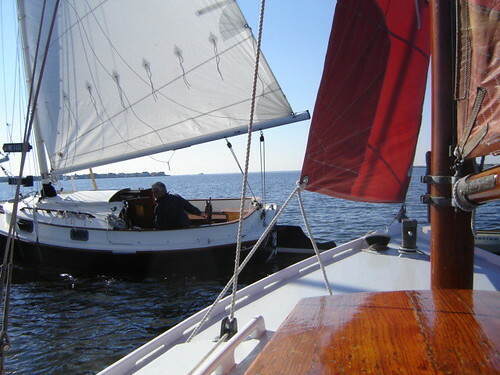 This site is a true inspiration for everybody that loves woodenboats and a slower pace-of-life. I´ve got my hands on a second-hand(!) Sardine here in Norway for my Oslofjord-style halfdekked “snekke”. Will install it during the winter. I just fell in love with your ship. Is it possible to get plans r drawings? Amazingly enough Fred, you can. Paul Gartside will sell you plans for a variety of Sjogin sizes and rigs. Join the Club? I’ve seen Sjogin in myriad Pics, and Pins on Pinterest She is a much admired boat. Joy to you and your wife in your sailing. and stuard-ship of such a lovely boat. Thanks Lauren. We’re glad to share the joy of Sjogin with those Boatstruck folks here and there.